► Which of BMW’s hot coupes should you buy? When BMW announced the back-to-basics M2 it had M-car fans worldwide rolling out the bunting and high-fiving each other in the street, because it was a car that promised to hark back to the glory days, to channel the best bits of the M Division back catalogue. And when CAR first drove the M2, it reminded us uncannily of the E46 M3, a spiritual dead-ringer in feel and ethos. The E46’s high watermark was 2003’s M3 CSL, a full 110kg lighter than the regular car with carbonfibre roof, bumpers and interior panels, lower, stiffer suspension and myriad other mods. To some, it’s the all-time pinnacle M3. If the M2 can measure up to the CSL, it truly is an M car of the gods. What will a CSL set me back? These days, pristine CSL values can top £60k+, but there are still tidy cars to be found for similar money to the M2’s £44k asking price. Sussex-based specialist Munich Legends almost certainly spends more time in the company of E46 CSLs than any other centre. ‘We’ll see a CSL in the workshop nearly every day,’ says MD Dan Norris, who owns the silver-grey example pictured here. Parked shoulder-to-shoulder, the two cars are surprisingly similar in size. 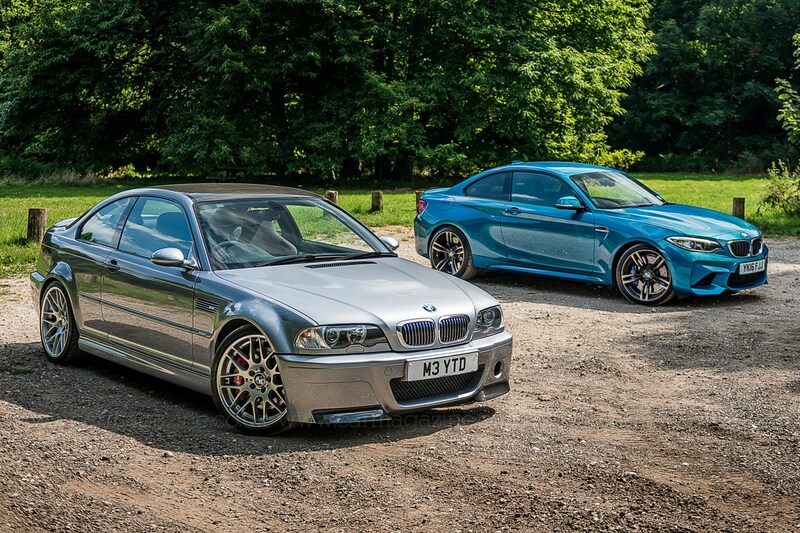 The M3 is a little longer, but the M2 is slightly taller, and noticeably wider. Where the E46’s flared arches pop neatly from its ageing-nicely shell, the M2’s body bulges like John Hurt’s stomach in Alien as it attempts to contain the M4-derived suspension components within. 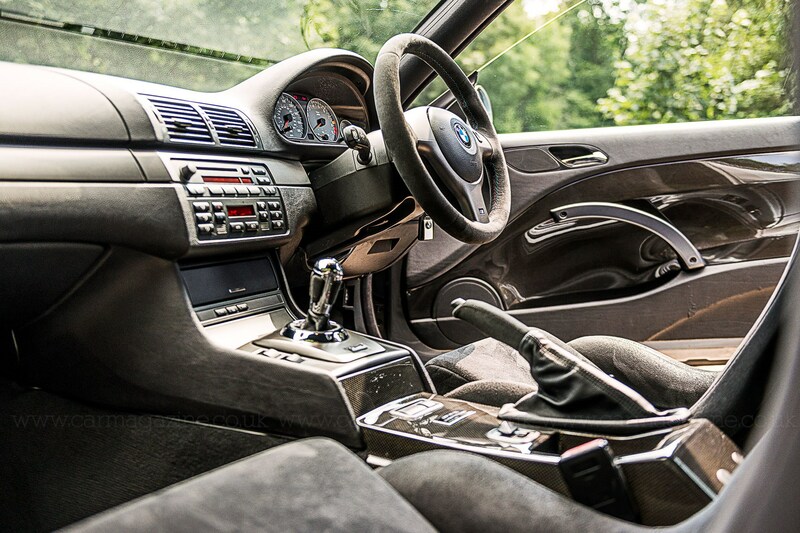 The E46 certainly feels roomier inside than the 2er, although the carbon doorcards and console leave you nowhere to put your elbows, and the fixed-back bucket seats make for a one-size-fits-some driving position. There’s plenty to help you forget about it on the move, though, not least the fantastic feel and response from the quick, light-ish steering – first flex of your palms against the alcantara wheel and you’ll feel the front tyres do the same. CSLs were originally fitted with semi-slick (and fully lethal in the rain) Michelin Cup tyres, but few remain on them today, most plumping for still-sticky but deeper-grooved Pilot Super Sports like the car tested here. All cars, too, got an automated manual ‘SMG’ (sequential manual gearbox); cutting-edge at the time, ponderously slow today. Shifts are clumsy in auto mode, and you’ll make better progress if you DIY, using the wheel-mounted paddles or push-pulling the lever like a DTM star. Either way, the dual-clutch DCT ’box available as an option in the M2 would have it for breakfast. How do they stack up on the road? The M2 is just as much fun as the hype suggests. With enormous front-end grip and rear traction to lean on, it’s a car you can trust, aided and abetted by great steering4 feel (though the CSL’s is greater still) and suspension that strikes a better balance between suppleness and tautness for British B-roads than the CSL’s ultra-stiff set-up. Try to have a conversation with your passenger in the M3 and your voice shakes as if you’re about to burst into tears. The M2 has fantastically powerful brakes, but the pedal’s trickier to modulate than the CSL’s more progressive stoppers, especially at lower speeds. In throttle response, too, the naturally aspirated CSL has the edge. 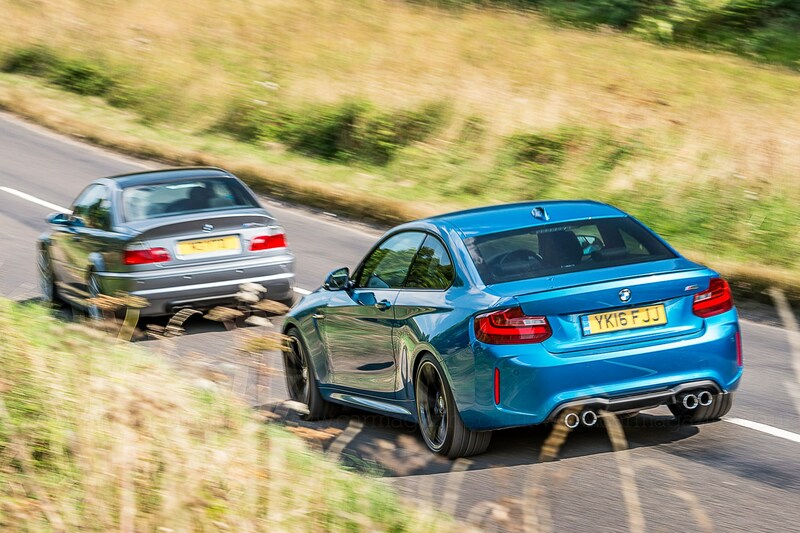 The M2’s turbocharged straight-six (a crossbreed of M235i and M4, with components from both) is superbly flexible and offers much more torque than the CSL, but you’ll get a bigger adrenaline hit from the E46. An enormous carbon airbox beneath the CSL’s bonnet lends it a unique metallic rasp, and it’ll snarl and howl all the way to an 8200rpm redline. And you can feel the lighter kerbweight in the car’s response to every input you make. The M2 is as fun to drive as you’d hope, but the CSL feels tauter, more responsive, more alive. M3 CSL service intervals are every two years, at roughly 12,000 miles, alternating between oil services and scheduled inspections. ‘You’ll rarely find a car that’s been serviced 100% correctly based on time [as well as mileage],’ says Dan Norris at Munich Legends, ‘but as long as it’s had the right number of inspections for its life, it doesn’t necessarily discount the car if it’s had a few late-ish services. Low-mileage cars can justifiably be a little light on stamps. The essential component is the running-in service at around 1200 miles. If it has no running-in service, walk away. Servicing costs are a bit more because the air filters are different. Otherwise, costs are similar to a regular E46 M3.’ Brakes are more expensive than a regular M3’s, and suspension parts can be difficult to get hold of, with shock absorbers and rear arms unique to the CSL. The M2 is subject to variable service intervals, with fixed-price service packages available. The £800 BMW Service Inclusive package lasts for five years/50,000 miles and covers MOT repair costs, and the Service Inclusive Plus includes discs, pads, and clutch components if required for £2870. Both cars sit in insurance group 42. 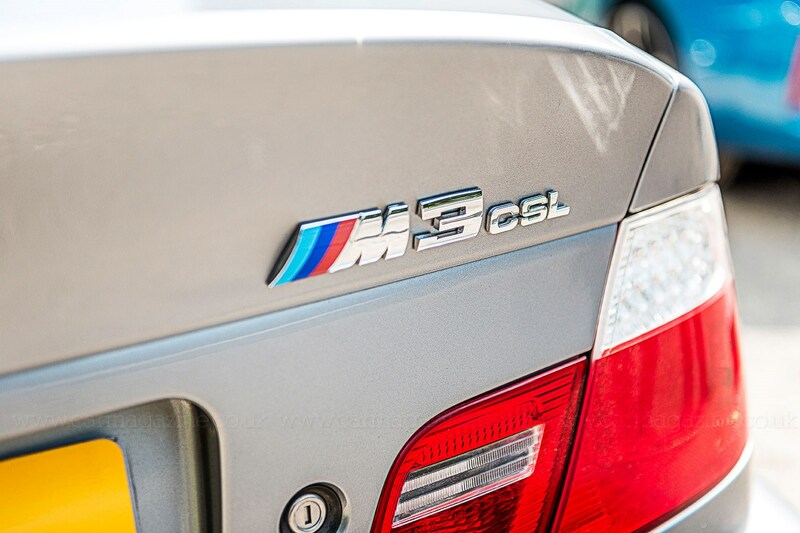 ‘CSLs live different lives from regular M3s,’ says Norris. ‘They tend to be second cars, driven harder, and very few haven’t been used on track. Anyone who says their CSL hasn’t been on a track probably isn’t aware of its past life, or is being disingenuous. CSLs have the same issues as a regular E46 M3, but they tend to arrive sooner. Many CSLs are modified, with wheel-spacers, brake and suspension mods common. ‘We spend a lot of time putting stuff right’, says Norris – but given the cars’ scarcity, you can’t afford to be picky. Only 422 CSLs were made available in the UK, and as many as 100 are thought to be out of action. The M2 and its M3/M4 derived parts are too new for reliability issues to yet be apparent. Munich Legends has recently performed a de-coke on a 1M Coupe, which could portend similar issues down the line for the M2’s related engine. 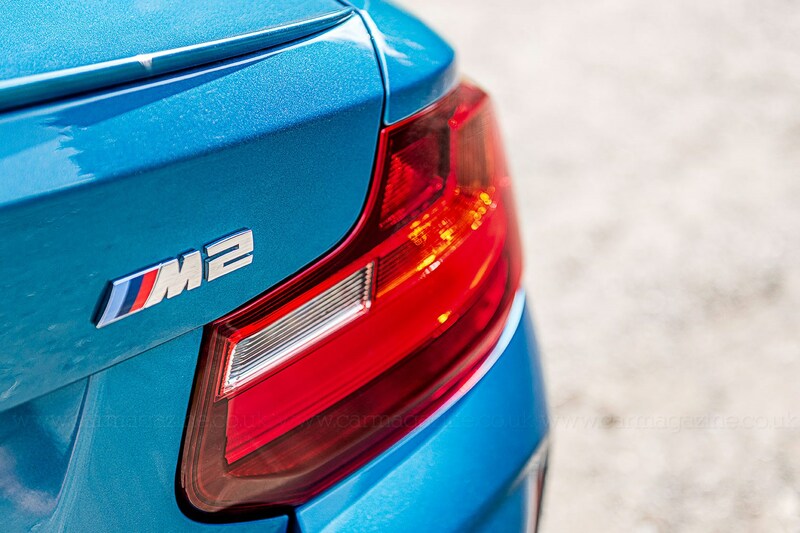 The M2 gets a standard BMW three-year, unlimited mileage warranty. The CSL was any colour you liked as long as it was silver-grey or black; the majority were the former. In keeping with its light-is-right philosophy, neither radio nor air-con were standard, but thankfully most UK cars optioned both. Rear parking sensors are recommended, given a replacement carbon diffuser costs £1000 + VAT. Original buyers could spec standard M3 wheels, but the CSL’s lovely BBS numbers are the ones you want. 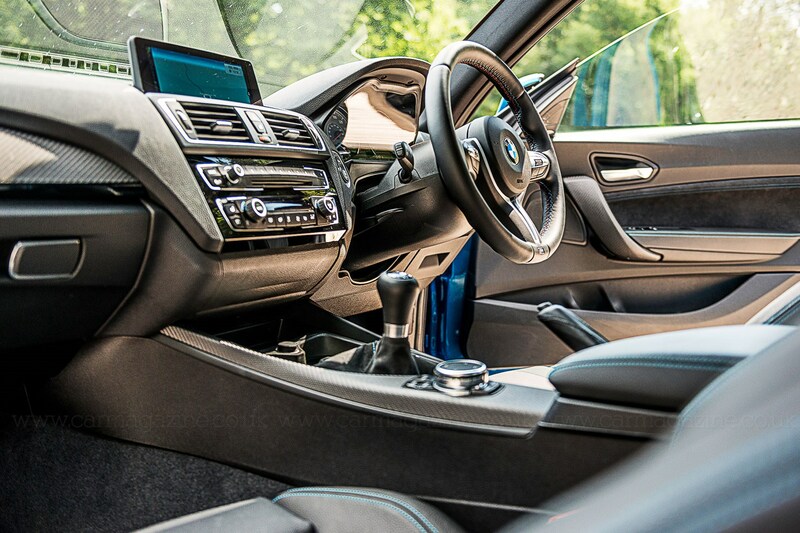 The M2 gets a generous spread of kit as standard, including air-con, sat-nav and parking sensors. DCT gearbox adds £2500. Electric front seats are easier to adjust, albeit heavier, and you can spec a louder sports exhaust if you want. Two great sports cars hidden in saloon bodies. The uncompromising suspension and seating makes the CSL harder work than the M2, but purer and more rewarding too. As a second car, to tuck away and watch its value rise while enjoying at weekends and the occasional thrilling/nerve-wracking track day, the CSL is the one. BMW says there’s no upper limit on M2 production, and unlike its limited-run 1M Coupe ancestor, it’s expected to depreciate in the mid-term like most mass production cars. But you could easily live with an M2 every day. And every day would be a good day. With thanks to Dan Norris and Garry Bird at Munich Legends (www.munichlegends.co.uk) for the loan of the E46 CSL.